Do you enjoy singing? Have you thought about joining a choir? How about joining us in Rainbow Chorus, Brighton’s friendly LGBT+ choir? We have new members nights twice a year (September and January) – no obligation to join and there is no audition! However due to our recent growth in numbers and the limitations of the space we rehearse and perform in, we may need to target New Members Nights to ensure we balance our sound and the overall size of the chorus is manageable. We always have specific needs for male voices in our Tenor and Bass sections. Our Musical Director will make a decision on all voice parts based on the ability to balance our sound as we approach a new members night. Now in its fourth year, this exciting group was set up to allow as many people as possible to experience singing in a group. RC+ workshops are loads of fun and a safe space where you can learn some great songs by ear, with sheet music and lyrics to aid if needed. The sessions are led by the Rainbow Chorus music team, dynamic and encouraging Musical Director Aneesa Chaudhry and gifted professional pianist Mojca Monte Amali. You DON’T need to worry about whether you can sing in tune, read music or commit regularly and you can just drop in! You get to choose whether you sing the tune of a song, a higher harmony or a lower harmony and you’re encouraged to try out singing in different voice sections. We explore topics that make you a better singer generally, including musicality, singing technique, breathing, posture, phrasing, tuning, listening, improvising and we help put theory into practice, helping you build confidence and making you stronger individual singers as well. If you’re LGBT+ and your voice is changing or you want to explore singing in a different voice range, RC+ is perfect for you. We have a real mix of members including folk who haven’t sung before or in ages, Trans and non-binary folk as well as some regular choir goers. We’ll look after you both in the session and at our social afterwards. Although these sessions are mainly funded by The Rainbow Fund, there is a subscription but this can be on a pay-as-you-attend basis and you are still welcome to come even if finances mean a subscription is not affordable for you. Our usual venue is St George’s Church in Kemptown for the Chorus and RC+, although we occasionally use other venues. 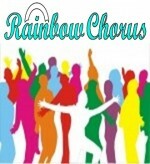 Everyone is friendly and we are a fun group to join, whether in Rainbow Chorus or RC+. If this form is not displayed correctly, please click here to see the form in a new window.